Here it is the beginning of November, and the first major snow is forecast for early next week. I scrambled all day yesterday to wrap up my outdoor work in relation to all the seed crops raised this season. I now have all crops harvested, threshed and inside, safe from the elements. The last step is drying and storage. Some crops, like soybeans and peanuts take a couple of months to fully dry down to a moisture content that is suitable for storage. Currently, a good portion of my house is set up with drying racks, covered with peanuts, various grains, squash and pumpkin seeds. 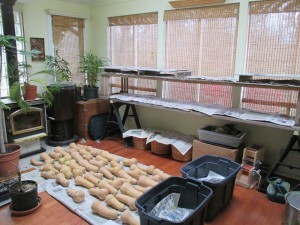 The dining room table is filled with tubs of drying beans. 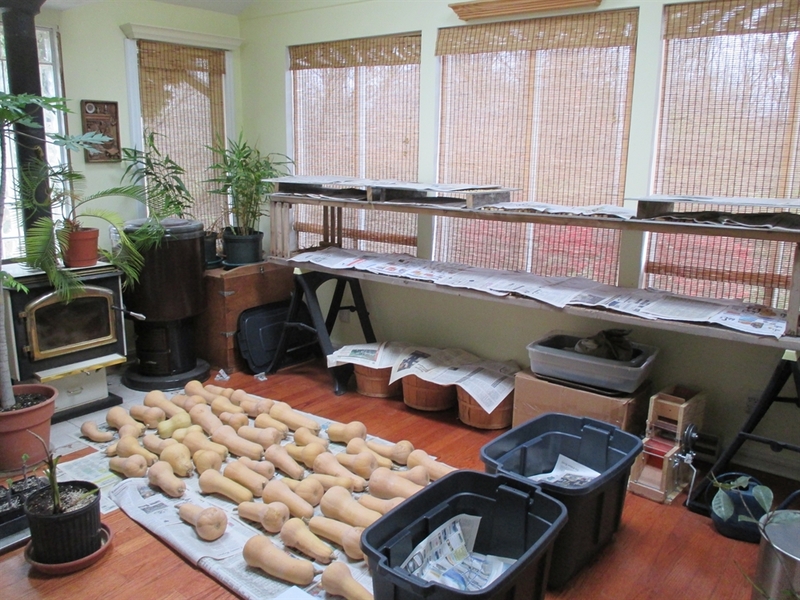 My wife, Suzanne, has a lot of patience for my seed operation this time of the year. Hopefully by Thanksgiving, I will have everything stored away in my basement seed room and the upstairs can return to normal. 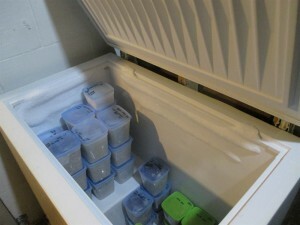 All of the grains and dry legumes (except peanuts) spend 5 days in a freezer. This eliminates the possibility of insects infesting the crops during storage. It is crucial to have the moisture content low, otherwise the freezing process can damage, and or, kill the viable seeds. Once out of the freezer, each crop is tested for germination rates. As these processes move forward, I finally have the time to write this post, and to begin entering information about all the new crops, like White Teff, Camelina and Quinoa, onto this website. I have 35 new crops to evaluate and test the seed for viability. If the germination rate is good, I will add these crops to the seed list. My goal is to have all my seed crops, available for purchase, updated on this website around the first of December. The cold months also grant me the opportunity to blog about my experiences with the various crops this season. I plan an update about the ongoing rice project very soon. 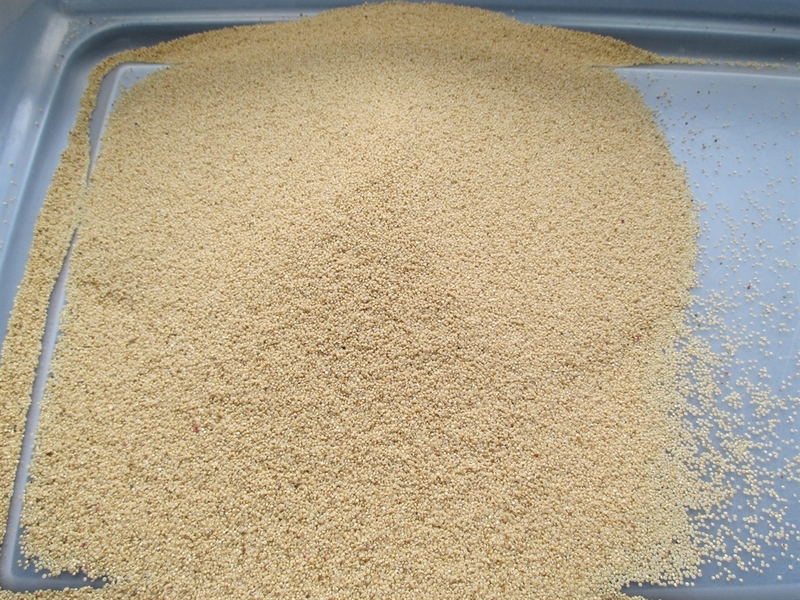 I finally located a small-scale, hand-crank rice dehuller which has made using the rice much more efficient. Last year I had to beat the rice with a mallet to remove the hulls. It took 45 minutes to get 1 cup of rice. Now I can dehull 1 pound in just a few minutes. I shot some video of the rice production from harvesting to the dehulling process. I will post the completed video just as soon as I learn how to edit video. I will also share my insights on two new crops I am excited about; Redhead Quinoa and Fercita Amaranth. Two nutritious super grains (pseudo-grains) that are generally not grown in our area. Given the right variety, and modified harvest techniques, I believe these could be a welcome addition to any farm or garden producing staple crops here in Northern Indiana. Food Security seems to be on the minds of a lot of folks these days. While I am in full support of organizations, groups and individuals advocating for more localized, safe and secure, food systems for our region, I also think the “food security” question should also be tackled on the home front. Consider adding staples, like grains and dry beans to your garden. 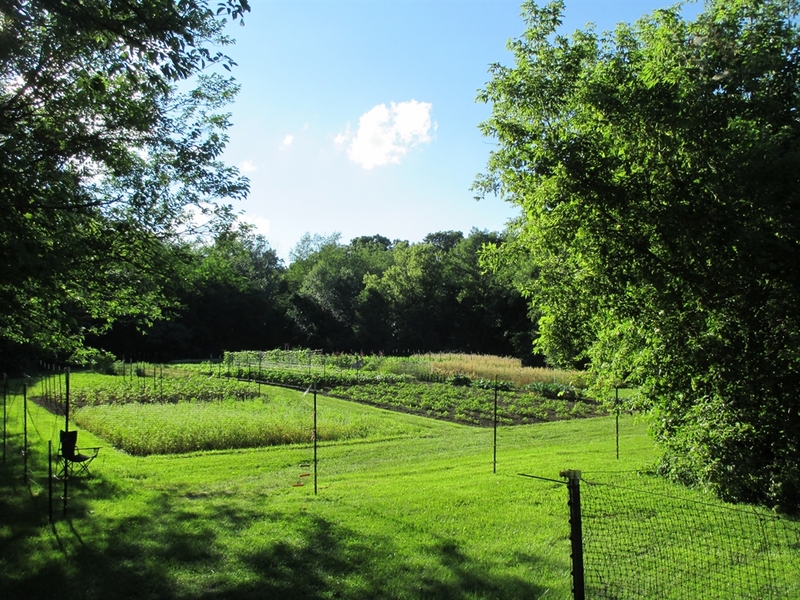 If you farm, consider raising open-pollinated crops and saving your own, reliable seed stock. If your garden plot is too small, be daring, get the rototiller out and till up the front lawn. A thousand square foot of wheat can produce 50 pounds of grain. 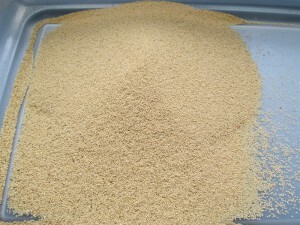 700 square foot of rice can yield 50 pounds of grain. Definite food for thought. Overall, it has been a good year in the fields, even with all the excessive rainfall. I am excited about all the seed varieties I will have to offer for the 2015 growing season. I will put up a post as soon as I am ready to start taking orders. 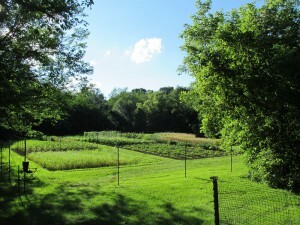 You can also follow Sherck’s Heirloom Vegetables, Plants and Seed on Facebook. This entry was posted in Grains, Legumes, Methods, Peanuts, Rice, Uncategorized and tagged GRAINS, LEGUMES, local, Northern Indiana Seed, Peanuts, Staple Crops. Bookmark the permalink.